A favourite ingredient in my personal diet is seafood. I often go for oily fish such as mackerel, Salmon and Tuna. The reason for this is the fatty acids found in these fish. They not only greatly reduce the risk of heart disease, stroke, dementia, Alzheimer’s and diabetes, they also help maintain muscle and help tap in to body fat stores, using them as fuel. You will see many references to oily fish in my articles for this reason. They really are a good health powerhouse food. Even if they do smell and taste a bit unsavoury! The recipes I have developed balance out the strong flavour of the fish with other ingredients that are also very beneficial to your health and well being. This is one of them I thought I would share. I may have to patent the others! 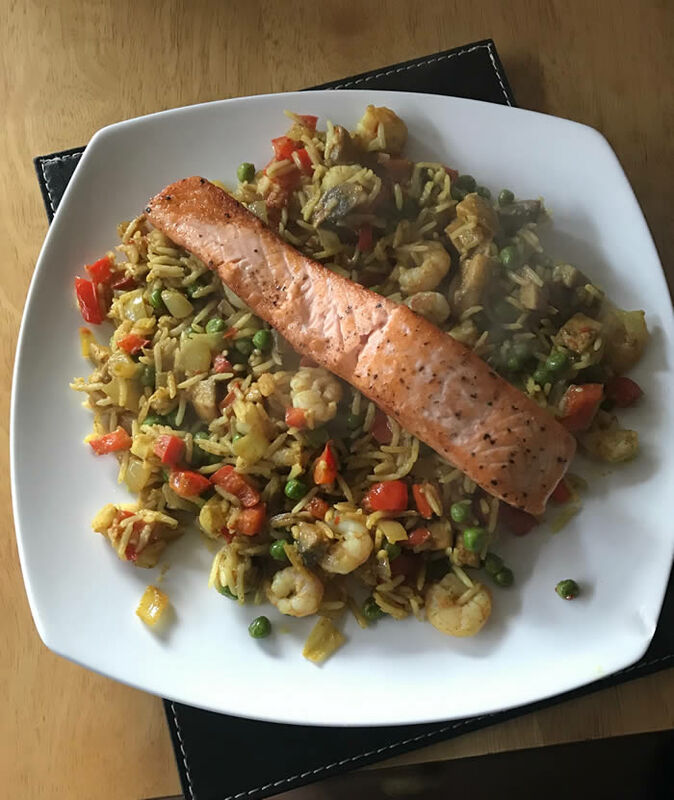 I use Salmon and Prawns in this one with Basmati rice and added vegetables and spices. You can also use brown rice, quinoa or any other type of grain you like. You can even make the recipe without any grains. Salmon is a great source of low fat and high protein with added benefits of good fats and minerals. 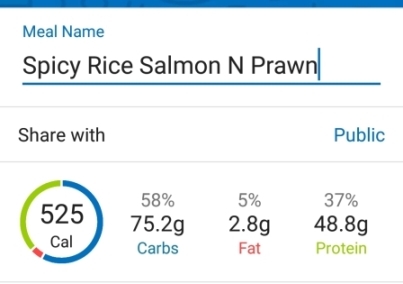 Prawns also are high in protein and low in fat. Together with rice, spices and vegetables, this dish is an all round winner. It’s low in fat, high in protein and very low in sugar. It takes roughly half an hour to make, so it’s not too demanding. There is some chopping and timing involved, but ultimately this is a very quick and easy recipe. So here goes for the recipe and method, it’s not that difficult at all! You can change some elements of this recipe to suit you. I will sometimes add some grated creamed coconut or some fruit juice for extra sweetness and mildness. The flavours are very much Indian inspired but the real beauty of this dish is not just the flavour but the health benefits each ingredient brings. Check back soon to see some other recipes that I have concocted! Walk, run, swim or cycle? Copyright © 2019 Ai Total Fitness Personal Training. All rights reserved.